I was looking out side the window at work, and this is what I saw. I had to draw It, I couldn't find my wacom pen, so I did a quick sketch with the mouse. I thought it was funny, but cool at the same time. 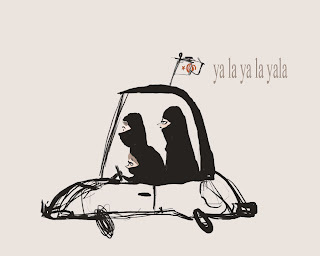 I' had never seen a Muslim women driving, with her veil thingy, I thought they weren't aloud to. Maybe they were rebelling against their husbands and were getting away. I just started using a wacom yesterday. Its so darn hard to control. I'll post a 2 drawing or 2 with the wacom........one day. LOL!! Yay Sadie has a blog too! Love all the stuff on here so far, and this particular post is super funny. Cool sketch, Sadie! At first I thought it was a ninja family on vacation. Now I may have to do that drawing myself. I love this sketch - I want a car just like that one! !